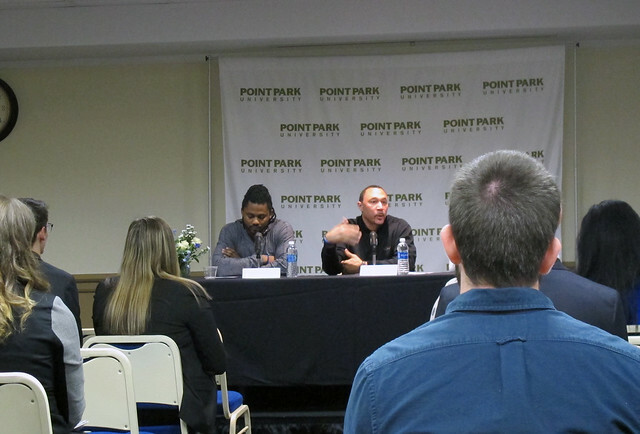 From PNC Financial Services to Live Nation Entertainment, Point Park University students and alumni networked with more than 70 recruiters at the Spring Internship and Job Fair, held Feb. 9 in the Student Center. The University's Career Development Center and the Schools of Business and Communication hosted the annual event. "The most rewarding experience I had at the fair was connecting with employers for internships," said Megan Thorpe, a junior sports, arts and entertainment management major from Rockwood Area High School in Rockwood, Pa. "I applied for an internship with the Pittsburgh Downtown Partnership and was able to make an impression by introducing myself in person at their table." Dan Braddock, promotions manager/producer for CBS Television Stations, stressed the importance of making a good first impression with a recruiter. "Just be yourself," Braddock said. "A lot of times students are nervous, but we want you to come up to our table and have a pleasant conversation so we can get to know you." Recruiters representing 31st Street Studios, Imagine Careers, Glade Run Lutheran Services, Pittsburgh CLO, Stage AE, Brunnerworks and the Washington Wild Things, among others, were eager to meet with students and alumni who are seeking an internship, part-time or full-time job. "We are hiring for a variety of internships and jobs," said Nick Donatelli, a recruiter/career specialist from AAA East Central. "I met so many students at the fair who are more than qualified for our positions and they haven't even graduated!" "The students I met have been so professional and forthright," said Steve Czajkowski, a sales engineer from Rockwell Equipment and Supply Co. "We're looking for someone with a marketing background who can help us redesign our websites." Emily Yount, a senior multimedia major from Deer Lakes High School in Cheswick, Pa., said she attended the fair not only to find a job after graduation, but to perfect her elevator pitch. "I tried to go to every single table at the fair - even if the company didn't have an opportunity I was interested in - to practice my elevator pitch and network," Yount said. "My Point Park experience is helping me tremendously to achieve my goals professionally and personally," said Sydney Patton, a sophomore SAEM major from Millersburg Area High School in Millersburg, Pa. "The career fair is a great way to begin building your professional network."